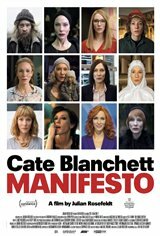 Cate Blanchett, Julian Rosefeldt, and others produced a highly intelligent, thoughtful, and provocative film offering current thinking on the role of human experience in the evolving broad socio-political movement through the language of the arts. Ms. Blanchett not only excels in her "chameleonic" ability to transform herself and her roles, but also in the poignancy of her ability to communicate a profound and satirical reflection on human meaning in relationship to our past and to each other. The film is very eclectic in it's communication of ideas that appear 'abstract' and diffuse but actually follow along a thread of the privileged human moment as center of the universe.